Reengaging the Prospects of Rhetoric reanimates the debate over the function and scope of rhetoric. Providing a contemporary response to the volume The Prospect of Rhetoric (1971), this volume reconceptualizes that classic work to address the challenges facing the study of rhetoric today. 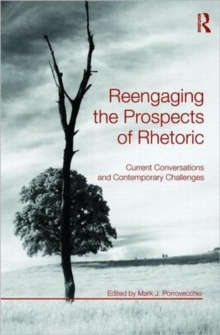 With contributions from today's leading rhetorical scholars, Reengaging tje Prospects of Rhetoric offers "response" essays to each chapter of the original work. Each scholar uses his/her essay as a forum in which to address three questions: As a historical document, why is this essay important? In terms of contemporary theory and/or practice, what is the significance of the essay? How can the issues raised therein be profitably addressed in the future? These provocative engagements suggest that, while the study of rhetoric has gained much ground in the intervening decades, there is more work to be done to reestablish the primacy of rhetoric in contemporary society. This volume provides students and scholars of rhetoric with a strong foundation in the issues that have shaped contemporary rhetorical theory and criticism. It offers them an accessible introduction to the challenges facing future iterations of rhetorical theory and criticism. As a standalone text or a supplemental resource for undergraduate and graduate courses in the history, theory, and criticism of rhetoric or contemporary rhetorical theory, it will help to shape rhetoric's future role in communication studies and will foster interdisciplinary dialogues about the topic.